Yesterday, we went to the beach. A really wavy beach. But little did we know that our friends would show up and surprise us. We had just tried out the freezing cold water when we saw someone who looked an awful lot like my friends sister. After staring at us for a while she finally yelled out, "Arca!". She ran back to her brother, told him something, and he immediately ran to us. What a weird coincidence! Seeing each other on the same beach, on the same time! It was awesome! Not only did some of my other friends come, his also came. One of them was my neighbor, Young! We made up some fun challenge games. In fact, you too can play them yourself! -The beach should also have some really big waves. HUGE and STRONG waves. In fact, enough to send grownups to the bottom of the water. I MEAN IT! 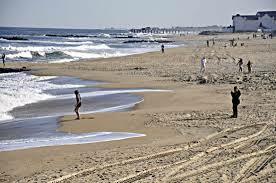 -It should also have very shallow water near the shore. -Enough talk about the water. The beach needs to be a sand beach. Gravel will not work with the challenges. -And of course, bring all of your friends, or else it won't be any fun! This was one one of the first things we did. So Young had dug a REALLY DEEP hole. It was black when you looked down. There are two ways you can play this game. One way to play is that you have to dig a very deep hole, while someone is filling it up with sand and trying to ruin it. Can't let that happen! Another way to play is by having people take turns standing up in the hole, and seeing who can get out the fastest! 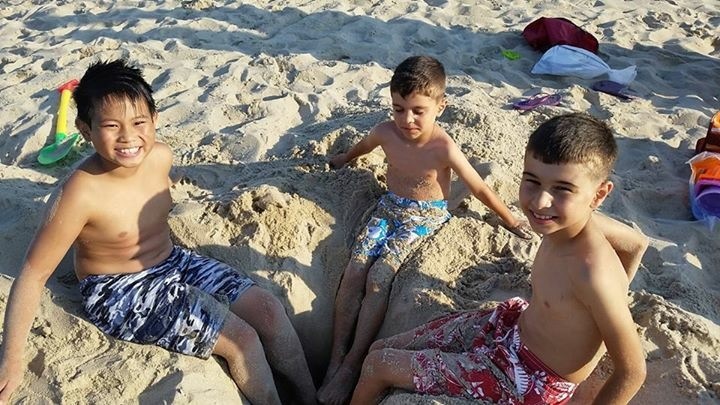 Above: Young (right), Onur (center), and me (left) putting our feet in the hole. This was probably one of my favorite ones. It is a survival game, basically. You get two or more players running out to the water, seeing who can stay the longest without being knocked out by one of the waves. If it knocks you off your feet and on the ground, you are out. The last player left wins! Trust me, this is harder than it sounds like, especially since the waves were extremely overpowered! It was pretty fun, yet challenging! Get two or more players on on the shoreline. The goal is to be the last player standing who hasn't been touched by the water. You have to run away from the incoming water, and if it touches you, you're out. May not seem that hard, unless you have a beach that is very much like the requirements I listed! Sometimes, the water, would close in so much, we would have to go all the way back to the beginning of the dry parts of the sand! Note: I did not take the photo above! It is another picture of the same beach. The last game we played, it requires wet sand next to the shore. You can have as many players as you want! You can do singleplayer, but multiplayer is a lot more fun! 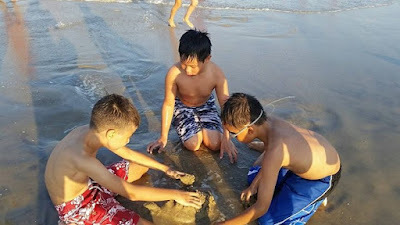 Each player has to build a sand castle, complete with a moat and walls. You have to make the sandcastle as strong as possible, so it doesn't get completely destroyed by the incoming waves. If your castle is destroyed, you have to stop working on it and help another player on their castle. Technically, the last player left standing wins, but you can take it even further than that! See how long you can last, in this awesome beach game! Above: Me (left), Young (center), and his friend (right), work on a sand castle together.